Before I explain why beeswax candles are totally awesome, first I will give you the low-down on the evils of the alternative. Most candles we buy are made from paraffin wax. Paraffin is a petroleum by-product, the grayish-black sludge that oozes out of the backside of the petroleum refineries. It is the substance left over after producing many of the other common petroleum products such as gas, oils, pavement, etc. This crud is then bleached with 100% strength bleach creating dioxins, which are toxic, and then is processed into ‘solid’ paraffin using various carcinogenic, solidifying chemicals. Candle companies purchase paraffin wax and then add various other ‘texturizing’ chemicals, artificial dyes for colour and synthetic fragrances. When synthetic fragrances are burned, they produce toxic fluoro-carbons and other polluting by-products. Inhaling these fluoro-carbons damages the receptors in our nasal passages that detect scent, and long-term, diminishes the overall abilities of your olfactory senses by ‘wearing them out’, one of the reasons why many people seem to ‘require’ increasingly stronger smelling candles (or Glade air freshener), etc., to experience any enjoyable aromas at all! Last, but certainly not least, is the indirect cost of burning a fuel like paraffin in your home, which emits black soot that coats your walls, household furnishings and curtains, not to mention your lungs and skin. It is a proven fact that paraffin, with its associated synthetic scents and other additives, causes headaches, allergic reactions and difficulties with sinuses and lungs. Anyone with respiratory problems should not burn paraffin candles, nor should those that want to prevent them. Now that you are convinced to never burn a Dollarama candle again, let me introduce you to beeswax, and the incredible properties it has to offer. Burning beeswax produces negative ions. Now, without getting too new age-y or scientific on you, I will just say that that negative ions are a positive thing, since they actually attract pollutants, in much the same way that a magnet attracts iron fillings. Negative ions attach to positively charged ions that hold in dust, dander, molds and other air borne contaminants. Once attached, the positive ions are weighted down and this drops both the ions and the contaminants to the ground surface to be swept up or vacuumed away. Bottom line: burning beeswax will actually clean your air. And to answer my friend’s question: while the initial cost may seem higher than paraffin candles, beeswax burns for much longer, and with many more benefits. Beeswax has a much higher melting point than paraffin and so it burns far more slowly. Costing only pennies an hour to burn, beeswax is much more economical than paraffin over time. Held in high esteem, beeswax has been used since ancient times, by Egyptian kings and Greek and Roman empires. You can purchase beeswax candles at health food stores and some farmer’s markets. Beware of imitations! Look for 100% pure cappings beeswax, which is the wax that comes from the seal around each cell in the honeycomb. Also, make sure the wick is made of a natural fiber and that there aren’t any artificial scents added. Pure beeswax should smell like honey, naturally. It really is evident by this article that advancements in medical technology are extremely essential if we want to save far more human lives. Thanks for giving this kind of up to day information. I didn’t know that regular candles could be so toxic! 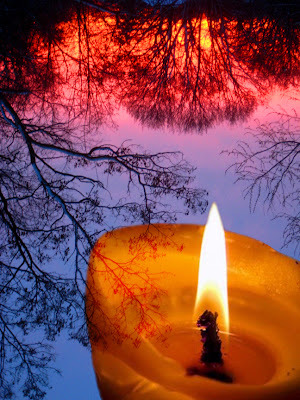 And I am a sincere candle burner…I love lighting up scented candles each evening. Will check my store for beeswax next time. Sarah, what about soy candles? Awesome. Think of all the deadly dinner parties over the years. Clean out the house!!! Sarah, again your blog has made me a believer. Paraffin will be hereby banned form my home! Long live beeswax!